The Oregon Ducks’ Rose Bowl 59-20 romp over former national champions Florida State captured the nation’s attention. But Ohio State head coach Urban Meyer, whose Buckeyes’ team will face the Ducks on Jan. 12 in the College Football Playoff National Championship Presented by AT&T, has been watching the Ducks for a while. Meyer has studied the football philosophies of offensive guru and former Oregon head coach Chip Kelly, even working alongside Kelly in 2011 when Meyer was an analyst for ESPN. Before Kelly, Meyer’s offensive schemes at Florida and Utah were similar to that of Oregon’s current offense, but the Buckeyes coach was really impressed by the “Win the Day” culture surrounding the team. Meyer, a two-time national championship winning coach with an astonishing career record of 128-25, is currently 16-0 in the Big Ten as the Buckeyes’ coach. Meyer has developed a strong football culture since his arrival in Colombus, winning the B1G Championship game and beating Alabama this year in the AllState Sugar Bowl semi-final game with third-string quarterback Cardale Jones. 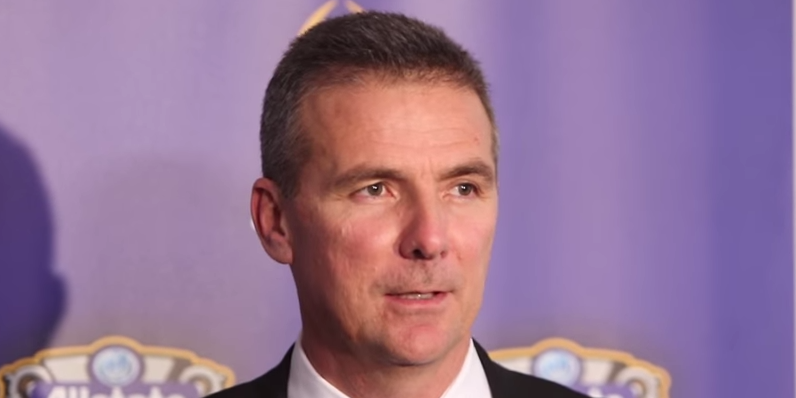 Urban Meyer post game reaction after hearing Oregon beat Florida State by nearly 40 points. The Buckeyes coach has learned from Oregon, but it’s Oregon’s mental alignment, coaching prowess and work ethic that the Buckeyes coach admires the most. “I just like their approach. When I went out there, I brought back with me that there’s an unbelievable culture. This is the way they do their business. Everyone is aligned. I brought that back to our place,” Meyer told USA Today. Meyer’s comments and long admiration for Oregon football is genuine, a demonstration of Meyer’s honorable sportsmanship and his very real respect and understanding of what the Buckeyes are up against in the national title game. “I think they’re cutting edge. They play fast and hard,” Meyer said. Oregon coach Mark Helfrich continues to perfect the Oregon football program. Oregon fans can expect to see similar offensive schemes come Jan. 12th in Dallas. But Oregon head coach Mark Helfrich’s belief in this Oregon team, from the coaches to the players, has the Ducks looking much more determined this time around on the national stage. ”But I think from a confidence standpoint, from a preparation standpoint, from a who we are standpoint, I have a ton of confidence in every guy in this room and every guy in our program,” Helfrich told the Associated Press. 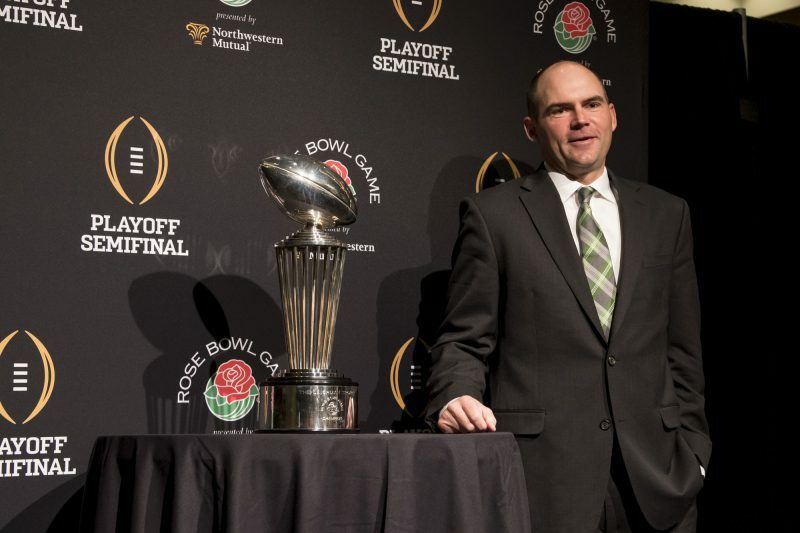 Both Meyer and Helfrich are perfectionists, combining their passionate love of football with clear expectations, guidelines and goals for their respective programs. Yes, Meyer has implemented some of Oregon’s successful techniques. But remember: imitation is often the most sincerest form of flattery.